Where you lead. | Almost Amazing Grace. When I was at home last week, I sat down to lunch with my mum for the first time in ages, and she said: "so, what are we watching with our lunch?" There was a short pause, then we both burst out laughing. What a ridiculous question. I'm not ashamed to admit that a television show plays a major role in my life. 'Gilmore Girls' has become an imperative staple in my family home, and lunchtimes spent watching it with my mum and little sister have become a sacred tradition. We always sing/wail along to the intro together, complete with our own actions and gestures, and then collectively wonder why we haven't yet released a mother-daughter hit single. My sister and I have both asked for the complete 7-series boxset for Christmas, despite the fact that we have pretty much every episode recorded on our TV. I often compare my mum and I to the Gilmore Girls; we have witty, fast-paced conversations (usually accompanied by hysteria), go on shopping trips around our quaint little town, and love nothing more than a movie night snuggled up on the sofa with sweets. 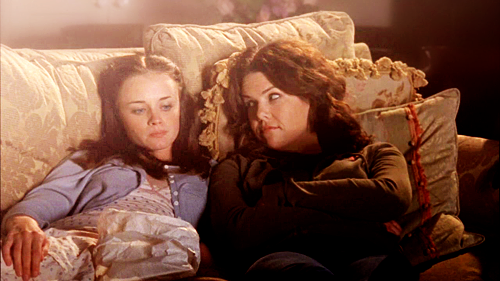 The main reason, however, that I see us as Lorelai and Rory, is because we've reached a point in our relationship where we are truly best friends as well as mother and daughter. Yes, we do call each other Lorelai and Rory. We've affectionately dubbed my little sister April, because of her cuteness and book-smarts. There is also an ongoing debate in our house as to whether my Dad is Luke or Christopher. 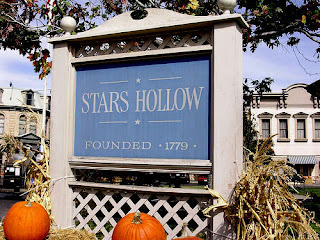 Whenever people ask me what my hometown is like, I will always say: "It's exactly like Stars Hollow, but with an Abbey and no hay bale maze." The shops are cute and family-run, and we tend to spend hours in each shop chatting to the owner. My friends hate walking down the high street with me, because every five seconds I stop to talk to someone I know. At Christmas time, everything is lit with fairy lights, and the whole town looks more Stars Hollow-esque than ever. My mum, little sister and I recently discussed who would be whom in Gilmore Girls in our town. My high school Drama teacher is Miss Patty, my friend who lives just down the road from us is Lane Kim, our neighbours Susie and Jason are Suki and Jackson, and the verbally incontinent assistant in the Post Office is Kirk. I don't think there is a fictional character that I can relate to as much as I do to Rory Gilmore. She had a challenging time at school meeting people's expectations, trying to fit in with the other kids, and being relentlessly tormented by a gang of girls. She wants to be a writer, and went to university to pursue her dream. She reads five books a day, and her idea of shopping is browsing for hours in the local bookshop. My ex-(and only) boyfriend reminds me a little of Dean, a lot of Logan, and even possesses a few Jess-like characteristics. Rory and I have even gone through the same evolution of hairstyles. I can only hope that my future is as bright as hers. The night before I left home to start at university, we all watched "The Lorelais' First Day at Yale", and when my mum dropped me off in my halls the next day there were countless quotes and references to the episode flying around. A few days ago, I confided in my mum that I wasn't sure if university life was the right choice for me. When I (reluctantly) returned to uni after my mini-holiday at home, I received a text from my mum: "Hey Rory, stay at Yale! We're all rooting for you back here in Stars Hollow. x"